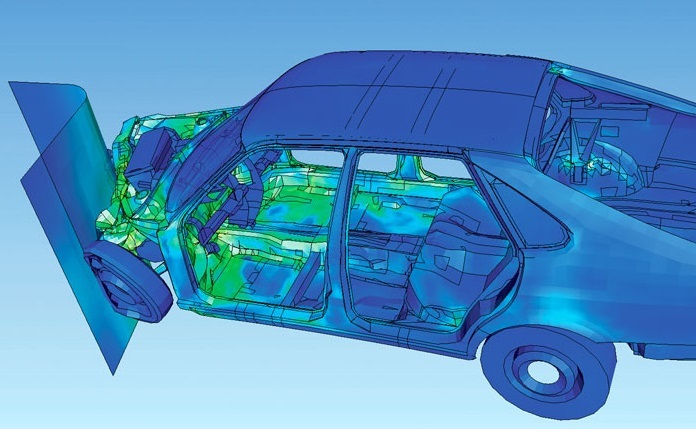 Car safety is not a topic to be taken lightly, and it is always an area where substantial research is being conducted. Now though, a brand new project from the University of California could be about to move standards on even further. The technology in question is a special high-resolution sensor that will change colour to indicate the pressure that a specific area of a vehicle is being subjected to. The device could also find a natural home within other mechanisms that feed upon pressure to ensure their operation too. The actual colour change is instigated by the separation of gold nanoparticles upon a polymer film. According to The Engineer, when these nanoparticles are properly interlinked they interact with the light to appear blue in colouration, yet when they begin to go their separate ways they swiftly change to a red hue instead. Because of the easy to observe contrasts that this process results in, the pressure distribution can be very readily noted even upon surfaces that are very complex in nature, and the potential within the world of safety is therefore tremendous. Previously, surfaces that were uneven were very difficult to examine for pressure distribution, but now such problems could be a thing of the past. At European Springs, we think that this news is incredibly interesting, as we have been playing a fundamental role within vehicular safety for many years. For example, we regularly manufacture quality compression springs that are used within car suspension, and, although you might not realise this, such small and seemingly insignificant components assist with the safety of many vehicles on a daily basis. Effective suspension not only absorbs the shock of impacts or jolts when you&apos;re travelling within a car, but it also allows the car to maintain its hold upon the road even through these disturbances, and also enables acceleration, braking and cornering to be carried out without fear of incident. Suspension might be taken for granted, but it&apos;s hugely important, and that&apos;s why we find it fascinating to see how other engineering solutions are being introduced to help in related capacities. Springs are similarly useful within a variety of other mechanisms, and although they may not be glamorous they&apos;re absolutely vital. If you find yourself in need of springs, no matter whether their purpose will be a greatly innovative one or a more &apos;run-of-the-mill&apos; utility, then you&apos;ll find no better supplier than European Springs. If you&apos;d like to find out more, be sure to contact us by calling +44 (0) 208 663 1800 or emailing info.bec@europeansprings.com.